With one foot in the knobby noise-twiddler's world and one squarely in anthemic rock, Parts & Labor has always had a balance to maintain. They have, over the last several albums, been sliding steadily towards the melodic side, and Receivers seems, on first listen, to be the apotheosis of this fist-pumping tunefulness. There's hardly any skronk at all in lead-off "Satellites," just a shimmery "I Can See for Miles"-ish striation of harmonies, a pounding beat and a sense of ineluctable triumph. The song is quite strong, probably damned near overwhelming live, but it seems too brightly colored, too friendly almost, to belong in the Parts & Labor catalogue. This is a band that annihilates in concert, its ear-splitting volume eased only by undeniable hooks. If it doesn't hurt, is it still as good? 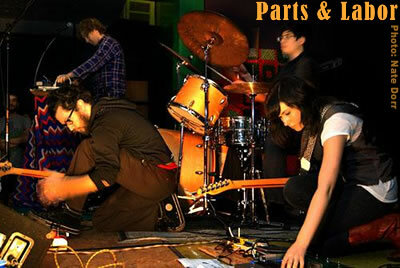 Parts & Labor has gone through its usual Chinese fire drill between albums, with drummer Christopher R. Weingarten slipping out the back, and Andrew Wong taking his place. Sarah Lipstate has broken the gender line, bringing a second guitar and a penchant for field recordings to the mix. But despite modest reshufflings, the core duo, Dan Friel and BJ Warshaw, remains intact. Whatever softening has crept into the sound--and there is some--must be an intentional shift. You hear it first on "Satellites," then even more strongly in "Nowheres Nigh," the free giveaway. The cut is downright restrained as it starts, a soft, monotone vocal over clamped drums and droning keyboards. The tune comes to a climax only near the end, the keyboards squawking and winding, the guitar pulsing and the chorus finally cresting into amplified Husker Du-into-Sugar sweetness. Later, "Mount Misery" starts like a folk song, prettily picked, gently plotted. As it pushes forward, there is a heft to the vocals, a squall buried in the peripheries, but the sharp edges are blunted, submerged, swaddled. How you feel about Receivers probably depends on where you came into the Parts & Labor show. It's not as noisy, not as confrontational, not as gut-charging hard as the earlier stuff, and if you've fallen for that era of the band's work, you'll miss it. Still, someone without preconceptions might recognize this as the large-scale, anthemic rock the music industry mislaid a couple of decades ago…and welcome it without ever missing the complications.